The contractor continues work on removal of curb, gutter, and asphalt in front of businesses along East Main Street. Upon removal, the right-of-way adjacent to US-36/East Main St. will undergo improvements, including new curb, gutter & driveways, landscaping, and sidewalk extending from Lyons Quilting to downtown Main Street. Parking access for all businesses will be available throughout construction. After a short period of construction slowdown, the Town was informed this week that Xcel is preparing for the pre-construction meeting for new gas line construction, in the Hwy 7/5th Ave. right-of-way. The next Board of Trustees meeting will be held Monday, May 16. The workshop begins at 5:30 p.m., and the meeting starts at 7:00 p.m.
May 14: 12 – 5 p.m.
May 15, 17, 18, 19, 20, 23, 24: 6 a.m. – 5 p.m. The Saint Vrain Creek Coalition (SVCC) was recently awarded funds for the Apple Valley Flood Recovery and Resiliency Implementation Project. Awarded funds will be spent on stream and floodplain rehabilitation and construction-related costs for the Apple Valley North (Phase I) project area. This area begins at the Rainbow Bridge (the northern bridge connecting Apple Valley Road to US 36) and extends 1.4 miles downstream along North Saint Vrain Creek. The estimated construction cost for this reach is nearly $2 million. DOLA awarded the SVCC $386,890 to leverage additional funding provided by the Natural Resources Conservation Service (NRCS) and Colorado Water Conservation Board (CWCB) for the Emergency Watershed Protection (EWP) Program. 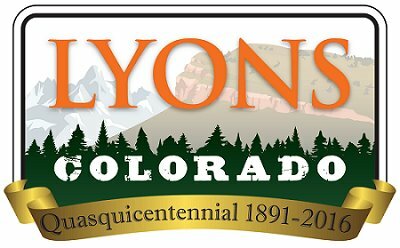 The Town of Lyons Parks and Recreation Department is seeking volunteers for both the Lyons River Run 5K and the Lyons Good Old Days Event - both taking place on June 25th. These Town events require volunteer help, in order to continue holding them! There are numerous fun jobs that need help, and all ranges of time slots available. Some examples include race course guidance, start/finish line assistance, registration data entry, and water station help for the River Run 5K, as well as help with ticket collection in the kids area, set up of the event, and clean up of the event. Please direct questions or interest to Lori LeGault, at 303-823-8250 or recreation@townoflyons.com. The full Good Old Days schedule will be released soon. Monday, May 23, from 11 a.m. to 7 p.m. The Lyons Regional Library District will be holding an open house to provide an opportunity for public input for the new library building preliminary design. The event will take place on Monday, May 23, from 11 a.m. to 7 p.m. in the Oskar Blues conference room. The recent survey results, past and upcoming projects, and other visual displays will be showcased at the event. Please see the flyer for more information. If you can’t make the open house, stop by the library or email Library Director, Katherine Weadley at katherine@lyonsregionallibrary.com, for questions or input relating to the project.